"Raphael" redirects here. For information about the Renaissance artist, see Raphael Sanzio. Raphael the Raven (also known by the shortened name Raphael Raven) is the leader of the Ravens and first appears as the boss of the fifth world in Super Mario World 2: Yoshi's Island. 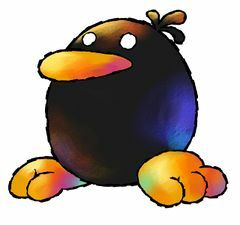 Initially, he is an ordinary Raven but is magically enlarged by Kamek to fight the Yoshis. Even after his defeat, he remains huge. When Blue Yoshi first meets Raphael, he is an ordinary Raven. However, Kamek appears and magically enhances him, increasing his size and strength. Then, Raphael slams into Blue Yoshi, sending it and Baby Mario flying to a small moon. Additionally, the force of the attack makes the Yoshi lose all its eggs. Raphael then launches himself to the moon and prepares for battle. Raphael fights by chasing and ramming into Blue Yoshi around the moon to send Baby Mario flying. He also attacks by jumping into the air and slamming the ground, creating shockwaves that circle the moon. The moon's interior is quartered by two Stumps extending its diameter, the ends of which jut out from two points on the surface. Yoshi must Ground Pound one of these while Raphael is on the opposite end to damage him. With each hit, Raphael becomes redder, angrier, and faster. After three successful hits, Blue Yoshi defeats Raphael and Raphael becomes a constellation in the sky. 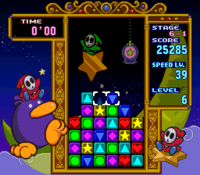 Raphael the Raven returns in the game Tetris Attack, allied with the Shy Guys. In this game, Raphael is not considered an enemy. He is also a playable character, replacing the moon fairy Seren from the original Japanese version. He is in the eighth level and is the last character to be saved from Bowser's and Kamek's brainwashing. Although Raphael the Raven does not appear as a boss in Yoshi's Island DS, he still makes a cameo. In the intro, one part shows a group of bosses from Super Mario World 2: Yoshi's Island, including Raphael and the others. Raphael the Raven reappears in Yoshi's New Island. Instead of being a boss, he is a generic enemy, and acts much like the other Ravens; Raphael can be defeated in the same way. He is found in Eggstraordinary Terrain in the area above the beanstalk. In World 2, the Kamek mini-boss battle is similar to the Raphael the Raven boss battle. Raphael the Raven reappears in Paper Mario. In this game, Raphael is the leader of a tribe of reformed Ravens that live in peace with the Yoshis of Lavalava Island. He lives in nest in a tree in Jade Jungle and has become a legend to the Yoshis (as no one except the Village Leader can remember actually seeing him). He has the ability to communicate with both Mario and his Ravens. Raphael helps Mario by ordering his Ravens to build a pulley contraption to take Mario and his allies to Mt. Lavalava, site of the fifth Star Spirit and the Lava Piranha. He also gives Mario the Ultra Stone, an item that allows Mario's party members to become even more powerful. Later in the game, he writes a letter to Sushie which the player can read at the Post Office in Toad Town. In the letter, he asks whether he can provide help for Sushie, such as helping her climb the tree or cooking things she wants to eat. "He's Raphael the Raven, the guardian of this jungle. Look at the size of this guy! He's enormous! I bet there's nothing he can't do. Doesn't he seem trustworthy?" Raphael the Raven makes a cameo in Super Smash Bros. Melee as a trophy. The information states that he is the biggest Raven, although it is Kamek who enlarged him. In Super Smash Bros. Brawl, he appears as a Sticker. The Sticker's information states that the artwork is from Super Mario World 2: Yoshi's Island; however, it actually uses the retouched Yoshi's Island: Super Mario Advance 3 artwork. Raphael also makes an appearance in Super Smash Bros. Ultimate as a Spirit which makes the fighter immune to any tripping effect like the earthquake hazard and the Banana peels. Spanish Rafi Raven From Rafael and Raven. The moon where Raphael is fought in Super Mario World 2: Yoshi's Island can be seen in the Yoshi's Island stage from Super Smash Bros. Brawl. Digga-Leg from Super Mario Galaxy 2 has a similar battle style to Raphael in Super Mario World 2: Yoshi's Island. Coincidentally, both are fought in space. 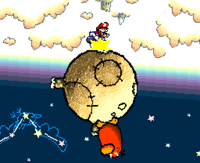 The Raphael Raven boss battle is the only instance in which Baby Mario does not cry when he falls off Yoshi's back, but he can still be taken away by the Toadies, possibly referencing how there is no sound in space. In Super Mario World 2: Yoshi's Island, Raphael's sprite has a star on his belly. However, since the star is always the same palette as his skin, it is never seen in-game. In Super Mario World 2: Yoshi's Island, Raphael and Naval Piranha are the only world bosses to use the extended variation of the boss theme. This page was last edited on April 13, 2019, at 16:58.